"Look what I just bought!" Along with a picture of him next to a fire brick pizza oven. "Mom's gonna be so mad..."
For the LONGEST time, my dad has wanted a pizza oven. Our homemade dough always comes out great when cooked on high heat in the oven but he has always insisted if it were cooked in a pizza oven it would be so much better. And he was right. The day it arrived we tried it out and well... it was a fail. Our pizzas were soggy, falling apart, and later we figured out the stone wasn't hot enough. The next day, Memorial day, one of my dad's closest friends came over to help us figure it out. 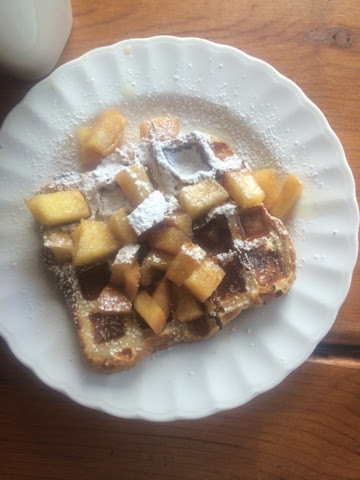 It was delicious. We take pizza night pretty seriously at my house, which always means having a fridge full of leftover toppings, sauce, dough, and fresh mozzarella. Lately, my mom has been overwhelmed with an event that's coming up so I've been cooking a lot for her- mostly lunch and breakfast, but last night I whipped up some dinner while she finished working. Now I'm not sure if I've ever talked about this, but I hate making soup. Most people, even myself, would think I'd love it, because it's just like a blank canvas. Nope. Something about it just isn't enjoyable to me. So of course, my mom requested soup. I'm not exactly sure why she wanted soup as the weather has been 100 degrees outside (or at least it feels like it). 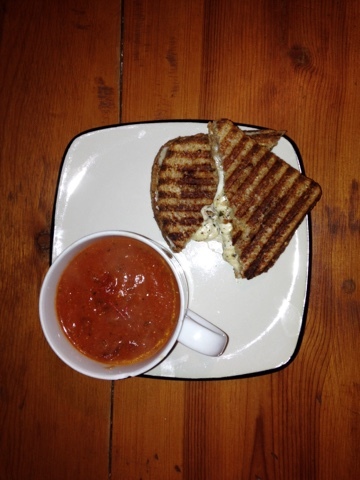 The only soup I can really work with is tomato soup, and when you have tomato soup, you HAVE to have grilled cheese. It's a must. I decided to use the leftover sun-dried tomatoes and pesto in it from our Pizza Night on Memorial Day, and man oh man, was that a good decision. 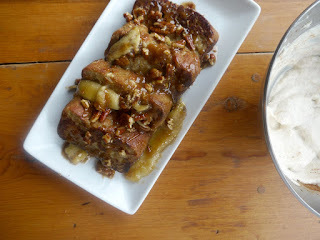 I wasn't planning on blogging this but it ended up really yummy! It makes for a perfectly hearty lunch... and it happens to be lunchtime right now, so I highly suggest taking 30 minutes to make this right now. I left it chunky but if you're more of a smooth tomato soup person, carefully blend it up a little at a time. In a medium sauce pan, cook the onions and garlic with the spices/sugar and olive oil until they start to sweat. Add the tomato and cook over medium-low heat until the tomato breaks down and releases juices (3-5 minutes). Add the tomato sauce, chicken stock, sun-dried tomatoes, and tomato paste. Bring to a light boil and turn down to simmer for about 10-15 minutes. Add more of any of the spices to your liking, and if it needs more liquid add water. If it is too thin bring to a boil and let it boil for 2 minutes, then reduce to a simmer- or add more tomato paste but make sure to cook the canned taste out. Add greek yogurt if you want a creamier soup. 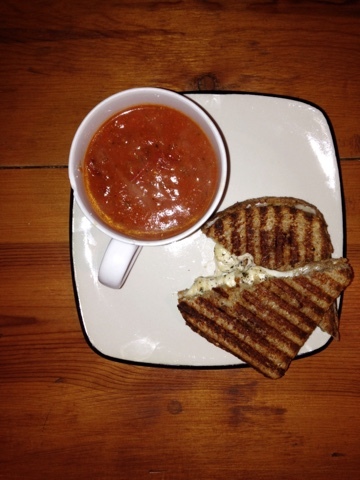 While the soup is cooking down, heat a panini maker or griddle. Brush the outside of each piece of bread with olive oil. On the turn to other side and place 1 slice of mozzarella on each piece. On 2 of the slices layer 1/2 oz- 1 oz fresh mozzarella on top. On the other 2 spread 1 tbs. pesto on each on top of the other slices of mozzarella. Sprinkle with black pepper. Place the slices with pesto & mozzarella on the other slices. Cook until crisp and slightly browned (cheese is melted). Cut in sandwiches in half and enjoy with a cup of soup. Don't forget to dunk the grilled cheese!